As a young collector of mid-century furniture, art and accessories, Tony Kitz fueled his passion for beautifully designed things through buying and selling, and by age 16 had established his first real business in the antiques world. Years later in business school, Tony was exposed to the fine carpet industry and knew he had found his calling, in a world of rare antiques and fine beauty. Since opening Tony Kitz Gallery in 1994, Tony has had the opportunity to work with the best designers and collectors in the Bay Area, providing them with the highest quality antique carpets available in the world today. The Tony Kitz philosophy is deeply rooted in the harmony of condition, age, beauty, rarity and great service. 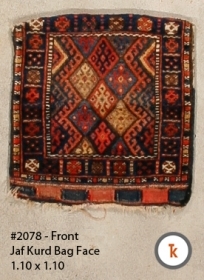 He has built a solid reputation with Bay Area designers for his diverse, unique, and constantly evolving inventory of modern and antique carpets, textiles, pillows and artwork from around the globe. Tony and his devoted team pride themselves on their high level of customer service, offering complimentary delivery and on-site consultations that make the process of selecting the right rug for any project a stress free experience for both designer and client. active since April, 2, 2007. #15735 Caucasian Bags ca. 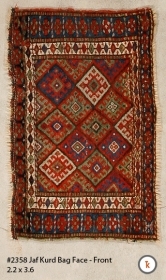 1910 - 1ft.5in wide by 4ft.1in long, Very good condition with on top border panel rewoven. 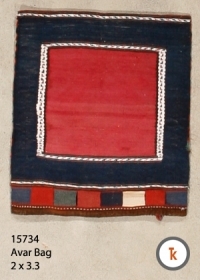 #15734 Avar Bag ca. 1900 - 2ft. wide by 2ft.3in. long Excellent condition on face with several small holes on back. 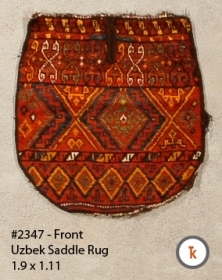 #15738 Shirvan Saddle Bags ca. 1910, 1ft.-7in wide by 3ft.-10in long. Excellent full pile condition. 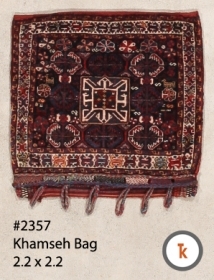 #2357 Khamseh Bag 2ft.-2in wide by 2ft.-2in long - ca. 1900 Southern Persian, excellent condition.